Your myconnect card is a banking product and has an expiry date. Check your card and replace it up to 3 months before it expires at any station kiosk. Complete the application form below to save time, or get one from a station kiosk. Check your card at a station info terminal for your card balance, and clear any outstanding penalties. Visit any station kiosk with your expiring card and R22 in cash. What happens to the value on my expiring card? The value on your expiring card will be transferred to your new card for immediate use. Mover points that are transferred to your new card are valid for three years from the date you last loaded Mover onto your expiring card. TIP: Top up your new card with Mover for any transferred points to become valid for another three years. This is because each time you load Mover, the points loaded and any existing points stored on the card become valid for three more years. What happens if I don’t replace my card in time? Your card will not work. 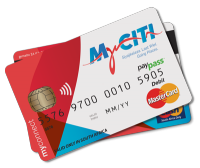 You can still replace your card at a cost of R22, but only at Civic Centre station. You will have to wait 32 days for money loaded as Standard to be transferred from the expired card to your new card. If there is more than one card expiring in your household, then one person can replace all of them, provided there is a completed signed application form for each expiring card. Save time by downloading and completing the application form before visiting a station kiosk.